About 300 volunteers joined forces Saturday to build a new playground at Mirschel Park in Hempstead Village -- a project residents said will target childhood obesity and keep children entertained. The volunteers, including residents, private company employees, government officials and members of nonprofit youth and business groups, spent the day assembling the brightly colored equipment and moving 43,740 square feet of safety surfacing by hand. "We've been waiting for this," said Madelon McCullough, founder of I Am Terrace Ave, a community youth group involved in the project. "This means a safe and clean place to play for the kids. It will help combat obesity and also helps mentally because they see the community's renewal." The new playground on Atlantic Avenue includes a tightrope, various slides and tri-level bars. "It feels different from the older playground that was dirty and peeling," said Aniya Letlow, 9, who was with her mom, Melody Letlow, 29, of Hempstead, painting wooden flower pots. The previous playground was more than 20 years old and crumbling, organizers said. Washington-based nonprofit KaBOOM! organized the project, and Bridgewater, N.J.-based Amneal Pharmaceuticals funded the renovation and provided 80 volunteers. "More than giving the money, we like to do something you can see built before your eyes," Amneal CEO Chintu Patel said. The playground, based on drawings created by children in a Design Day event in July, will serve the more than 700 kids in the area, officials said. "Doing the playground really gives the kids a nice new environment to play in," village Mayor Wayne J. Hall Sr. said. He added that the second phase of the project -- to be done by next summer -- will include installing swings and sprinklers. A few steps from the park is Terrace Avenue, a six-block area that Nassau County District Attorney Kathleen Rice described in January 2009 as Long Island's most notorious "open-air drug market." As a result, Rice created the Council of Thought and Action. "This area has always been a high priority for me as a DA," said Rice, who came to help build the playground. "This is what community engagement is about. This is a community that has been reborn." Halle Holmes was 10 years old in 2010 when she came home empty-handed and aggravated after a trip to the local mall. As hostess of an upcoming spa party, she had her heart set on finding all-natural beauty products in fun fragrances that her girlfriends would like and her sensitive skin could tolerate. As the saying goes, necessity is the mother of invention. The Holmes sisters began researching their idea online, tapped their family dermatologist for advice, and sent their mom out to investigate a few cosmetics manufacturers they identified. With $6,000 in startup funding from their parents, Halle and Brea officially launched their beauty products business the same year. Named Sweet Dream Girlz for a favorite Beyonce song, the Holmes’ line of moisturizers, cleansers, lip balms, and hair products are paraben- and talc-free, feature shea butter and natural oils, and come in “yummy” scents like Pink Sugar and Iced Lemon Cookie. From sales online, at trade shows, and in specialty stores nationwide, the business generated more than $25,000 in revenues its first year, and $42,000 in 2012. According to mom Lisa Holmes, Sweet Dream Girlz is profitable, but all income goes right back into the company to support marketing and new product development. The young entrepreneurs—now 13 and 19—have been featured in USA Today, Tigerbeat, local television news, and various other media. They were invited to the 2012 Nickelodeon Kids Choice Awards where their products were featured in the swag bags. And they’ve made it to the final casting call for season 5 of ABC’s Shark Tank. 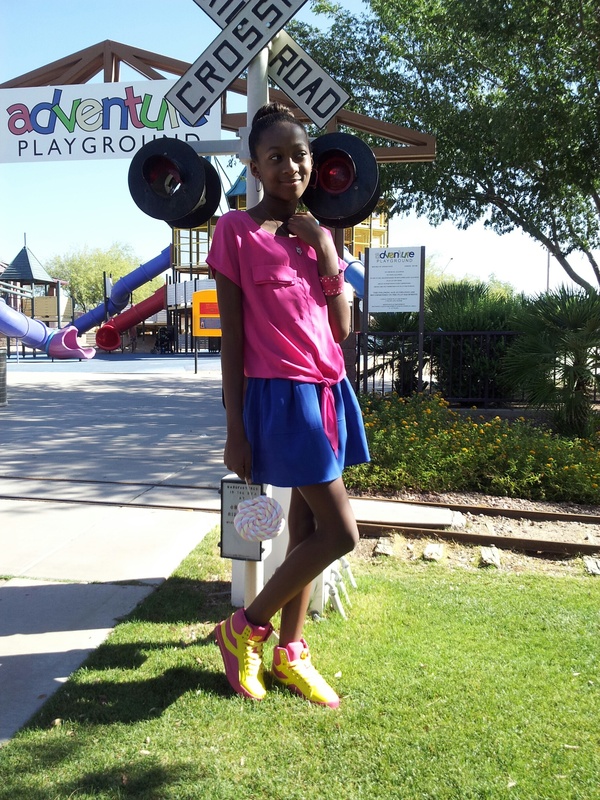 Halle Holmes in Sweet Dreams Girlz apparel Despite all the exposure, however, buyers at major stores including Dillard’s, Nordstrom, and Justice have turned them down. So have big beauty brands Ulta and Avon. “The typical response is that they haven’t carried it before, they’re skeptical they can move it in their stores, and they want you to come to them with big sales volume numbers before they’ll try,” says Lisa Holmes. But the sisters are confident those buyers are missing out on a big market. Tween and teen girls are consumers of spa and beauty products, they say. The only reason they don’t buy products specially made for them is because they’re not available, they say. So, they figured out how to reach that market themselves. This week they introduced Spa Diva, a network-marketing program that sells a $350 “mobile spa kit” to their business-minded peers. Girls as young as 16 can purchase the kit and earn commissions hosting in-home mani-pedi parties and taking orders for Sweet Dream Girlz products from their friends. The kit includes manicure, pedicure, and facial supplies, party-hostess advice, and a “business resource CD,” that tells how to make a professional presentation, talk about the products, and engage with customers. Brea, who was in high school when Sweet Dreams Girlz launched, will start her sophomore year at Woodbury University in Burbank, Calif., this fall. In addition to her studies in fashion design and marketing, she dedicates about four hours a day to the business, including video-chat meetings with her sister at home in Phoenix. Jaylen Bledsoe, 15, of Hazelwood, Mo., however, is just that rare breed of high school sophomore. He started his own tech company that specializes in web design and other IT services, Bledsoe Technologies, when he was just 13 years old and worked toexpand it into a global enterprise now worth around $3.5 million, Fox 2 in St. Louis reports. The local news station followed up with Bledsoe on Monday after first interviewing the teen back in March 2012. Since that first interview, Bledsoe has grown his company from two workers to about 150 contracted employees in order to meet demand. Meanwhile, Bledsoe has pursued other, more traditional goals for a high school kid. He's held leadership roles in a variety of student organizations, such as president of the Student Council and the Parent Teacher Student Association. Outside of school, he's served as the chief technology officer of St. Louis Volunteen, a program to promote teen volunteerism, according to Patch. He was even partly responsible for bringing vegetarian options to his former middle school's cafeteria. Jaylen said an interest in web design, which he first discovered while attending classes at his school's gifted-education program, was the foundation for his business. But he says it's taken a lot of hard work and courage, too. His most important advice for young entrepreneurs? "Take risks," Bledsoe, who plans to attend Harvard University before becoming a copyright lawyer, told Fox 2. "As a minor, there's nothing you can do that will shoot you down for too long. You can always jump back up and keep going." Story contributed by Harry Bradford of The Huffington Post, with consent. BusinessWeek.com offers an article regarding how to Kiss Those Student Loans Goodbye, but indicates that even with a number of programs out there, qualifying for them isn’t always easy. In the last year or two, a number of programs have emerged that are designed to assist students with student loan repayments. Because there are thousands of students who are finding it difficult to land a job in the down economy, or who have lost their jobs before paying off student loan debt entirely, programs like SponsorChange.org are gaining popularity. When students volunteer in their communities, SponsorChange.org helps them repay their student loans. Americorps – In exchange for volunteering for one year, individuals receive a small living stipend and an education award of $4,725, which can be applied to existing student loan debt or future education courses you choose to take. Peace Corps – In exchange for volunteering for two years in a foreign country, students can defer loan payments during their two-year term of service and a cancellation of federal Perkins loans up to 15% for one year of service and 70% for four years of service. After you complete a two-year term, you receive a $6,000 readjustment allowance, part of which can be used to repay student loan debt. Sponsor Change – Located in Pittsburgh, Pennsylvania, this program allows young working professionals the ability to volunteer their free time in exchange for stipends paid by program donors, which are used to reduce student loan debt. You must have a bachelor’s degree and proof of student loan debt. Work Programs – There are a large number of career specific programs available that let you work in your industry in exchange for forgiving or paying off student loan debt. There are also some circumstances which allow students to completely wipe out their student loan debt, such as military or public service, and certain volunteer situations. Debbie Dragon is a full time freelance writer and the co-owner of ReliableWriters.com.